Naftule's Dream is the progressive, "post-klezmer" side of the group that is otherwise known as Shirim Klezmer Orchestra. In this configuration, vocals are replaced by electric guitar, and the band focuses on modern music. The first album on Tzadik, The Search for the Golden Dreydl was released in Dec. 1997, followed by "Smash, Clap!" in 1998 and Job in 2001. A live album, Naftule's Dream / Live in Florence, followed in 2002. "Blood" was released in 2016. Contact: Eric Rosenthal, 617 522 2900. Web: www.naftulesdream.com. The Natasha Folk Project, Boston, MA, is an organization of professional musicians performing world music around the Greater Boston, MA area. Our repertoire includes songs and tunes from Europe and Russia, as well as Jewish and Gypsy. Enjoy the show with Natasha Folk Project! Di Naye Kapelye play majorly wonderful old-time European klez, based in large part on field research undertaken by bandleader, Bob Cohen, with friend Josh Horowitz, throughout Hungary and Romania. The core lineup of fiddle, bass, and accordion will knock your socks off. Accompanied by occasional clarinet, expect to be converted to a different understanding of klez. [notes, ari, 9/96] As of 9/98, a CD is available on Oriente, RIEN CD 17. It is wonderful. It was followed up in 2001 with "A Mazeldiker Yid" and in 2008 with Traktorist. Web: www.dinayekapelye.com. Write: Di Naye Kapelye, Budapest 1142, Dorozsmai utca 7/b, I.4, Hungary. Nayekhovichi, Moscow, Russia, started in 2004 as a modest but ambitious folk quartet with tuba and electric guitar (as heard on the debut album "Proschay Korova"—"FareWell Thee, Cow"). They have since grown into a flexible, loud and extravagant klezmer rock'n'roll 9-piece orchestra. Half of the repertoire is bunch of liveliest klezmer tunes treated with honesty of a drunk goldsmith while the other half is vocal songs—some of them folk Yiddish, some of them original compositions in Yiddish, some Soviet pop, some klezmerized rock. The Nayekhovichi feel and sound equally well at oligarch Jewish weddings in Moscow, in clubs from Taganrog to London, and on festivals such as "Simcha" on London's Trafalgar Square. The reed players Alik Drobinsky and Max Carpycheff are graduates of Cisinau (Moldavia) and Odessa Conservatories respectively. The band has collaborated with Sophie Solomon, Merlin Shepherd, Paul Brody and Michael Alpert, among others. In May 2007 Vanya Zhuk is invited to ride the Klezmercruise as guitarist of the all-star Klezmer band, featuring among others David Krakauer. Band members include: Vanya Zhuk: vocals, guitar, trombone; Alik Drobinsky: clarinet; Max Carpycheff: t-sax, clarinet; Sergio Romale-Chavale: accordion; Mark Guy D'ar: bass; F.(dot) Machine Genius:snare drum and cymbals; Zheka Lizin: tsimbl, poyk; Ramil Shamsootdeenoff: trombone; Vadim Yagman: trumpet. Tel: +79037211331. Web: www.nayekhovichi.ru. The New Klezmer Trio fuses experimental jazz and klezmer. Formed by former members of Hotzeplotz and The Klezmorim, the music always succeeded on its own terms, and you can hear the transforms of traditional music on the avant garde side. To me, the music appeared to get more cerebral, less accessible, and more distant from klezmer from the first album to the second, but that may also be me, in the role of an ultraorthodox Jew trying to comprehend Jewish secularism (a comparison that makes me, a secularist in real life, uncomfortable in the way it points to my limits). On the other hand, jazz musicians have told me how much they dug what the band was doing. Both of the band's albums are now available on John Zorn's Radical Jewish Çulture label. A capsule reviews is available of Masks and Faces. We are the New Orleans Klezmer All-Stars! Where do you live? We tour a lot and may be in your neighborhood. Ot Azoi!, N.O.K.A.S. (your regional source for yiddish-funk). Our first album was released in 1994. The second album (spring, 1996) is Manichalfwitz. Then there was The Big Kibosh, 1997, "Fresh Out the Past," 1999, and most recently, "Borvis", 2003. For video/audio of the New Orleans Klezmer Allstars, including performance footage and interviews, please check out https://www.foreigntv.com/music.html. Tel: 504 866 1710. Web: https://www.klezmers.com/. The New Shtetl Band, based in Albuquerque, NM, plays traditional klezmer music and the music of Eastern Europe, the Balkans, Greece and the Middle East. The band was one of the early pioneering klezmer groups in the US. It takes its name from the small towns and ghettos, called shtetls, in which Jews lived from the middle ages until the middle of the 20th century. The band is recognized locally and nationally for its repertoire and broad range of soulful playing. It was instrumental in introducing this music to the Southwestern USA and continues to play a vital role in Jewish communities providing music central to people's lives, celebrations and rituals. The band has a CD available on CDbaby.com. Next Village was the fusion world folk concert band fronted by violinist Kaila Flexer. They recorded two albums as "Third Ear," and then changed their name (conflict with a British Rock band). Their first album, Listen was reviewed on these pages, as was their album as "Next Village." The band is no longer extant. Nice Jewish Girls Gone Bad, based in NYC, is a refreshing mix of comedy, music, spoken-word and show-stopping burlesque, featuring the gals who learned to smoke at Hebrew School, got drunk at their Bat-Mitzvahs and would rather have more schtuppa than the chupah, featuring performers seen on Comedy Central, HBO, and Late Night TV. These badass chosen chicks boldly dare to deconstruct years of tradition, expectations and guilt in a fast-paced vaudeville extravaganza, complete with kick-lines, punch-lines and a rendition of "L'chaim" with a fist in the mouth. This ain't yo' mama's "Fiddler"! Nice Jewish Girls Gone Bad is backed by their very own klezmer all-star band, The Four Skins and featuring Go-Go by Sister Schmaltz. Web: www.nicejewishgirlsgonebad.com. The Mark Novak Band. 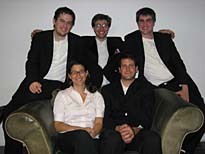 Since 1994, this Washington, DC based band has filled the niche for a band that can really play both great Jewish AND contemporary American dance music. From the music of the Romantics, Brian Setzer, Elvis Costello, David Bowie, Bruce Springsteen, Bob Marley, Van Morrison, James Brown, Frank Sinatra to Israeli Folk Dance to Shlomo Carlebach (z"l)! Soulful, Rockin', Joyous Jewish and American music? Excellent. Web: novakband.blogspot.com/. Nussbaum, Smidl & Ougaard Klezmertrio, based in Copenhagen, Denmark, features Channe Nussbaum (see "Spielniks") performing Jewish folk music and klezmer with only vocal, fiddle, and accordion. The band has recently released a CD (2002), "Klezmertrio". Web: www.trioklezmer.dk.